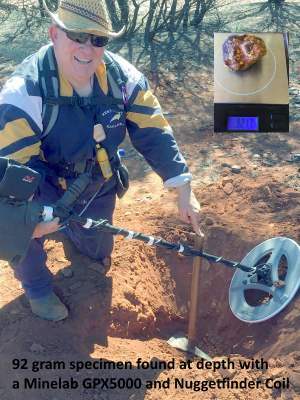 Udo and I want to make sure you get completely unbiased minelab 5000 reviews so we purchased a Minelab GPX 5000 metal detector and have started to field test it in the West Australian goldfields. We have no affiliation with Minelab or any of its sales agents and we purchased the machine at full price so you can be sure that what we say is how we see it! Here is a video of the first impressions we have and we will undertake a number of tests over the next few months on the machine and post the videos on this page for you. Since we wrote these Minelab 5000 Reviews, two new PI detectors have entered the market. The GPZ7000 is a better detector than the GPX5000. It is also costly, heavier and you need to use it often to return your investment. I (Bill) use the GPZ7000 and believe it is the superior Detector but you could not convince Udo to upgrade from the 5000 to a 7000. So the decision is yours to make but either of those machines will produce gold on the WA goldfields. If you are happy with small gold then the SDC 2300 is a good detector and much cheaper than its bigger brothers. Do you Agree or Disagree with what we say the Minelab 5000 Reviews? Why dont you add your Minelab 5000 reviews to the bottom of this page there is a lot of people just like you that are trying to work out whether to invest the $AUD6000 Plus in this machine? ...Help them out by including your review at the bottom of this page - at Heres My Unbiased Minelab 5000 Review. So far three users have tested this machine and all are experienced operators with the Minelab 4500. They did not find the new machine very difficult to just turn on and start detecting. Comparison Between the Minelab 5000 and the Minelab 4500 Metal Detectors. Simplicity of statup and Use How EASY is it to startup the machine and start detecting This is a difficult question with two answers. (2) If you are new to the Minelab 4500 and Minelab 5000 then you will need to spend some time on reading the manual and testing the machine. There is a fair bit to learn to get it operating optimally. Any Changes to the 4500 out of box setup If you have purchased and used a Minelab 4500 before the out of the box construction of the machine will be easy. If not it could be a bit fiddly but if you follow the instructions then its not too difficult. Is it quieter than the Minelab 4500? All three users testing the machine think that the Minelab 5000 is significantly quieter to operate than the Minelab 4500 and that is using a range of coils up to 17" and in a range of hot grounds. UPDATE: We have tested the Minelab 5000 extensively since it came out and we would not use other machines, it performs well on all grounds and is dynamite on small gold. What is the Rx Gain and why is this significant? The lower the Rx gain the less ground signals you pick up so the machine is less noisy BUT a high Rx gain setting will enable you to pick up smaller and deeper gold. This is an important part of your metal detecting armoury and you need to adjust the Rx gain to the highest settings you can given the ground conditions that you are detecting. The changes in the Minelab 5000 are more significant than we expected. The Machine is Quieter and with the Rx gain slots increased to 20 we were able to really crank it up high without excessive noise. This change is actually a real plus. Additional Benefits in Purchase for the Price? Any Improvements in the offering over than the 4500 given the extra price tag? You do get the additional mono coil but most people buy and use after market coils anyway so this is not worth the extra money. There is no control box cover included and the machine still comes in a cardboard box which to our mind for the price is pretty poor - make sure you screw down the minelab seller for some extra equipment if you buy the new machine. Update; we believe that the additional improvements in the Minelab 5000 make it a very good buy and well worth the additional cost. From our point of view if you are in the market for a new machine and you can afford it, go for the best and latest technology you can which is the Minelab 5000 without doubt. If you are watching you pennies then you might consider the benefits of buying a good used Minelab 4500 at the current market prices around the $4000 mark and save a few grand - UPDATE - with the new Minelab GPZ7000 coming out soon then there will be a flood of the older detectors on the market, it might be a real opportunity to buy a GPX5000 at a good price. Here is a letter I sent to a reader in Febuary 2015 about the current flood of Minelab 4500s and Minelab 5000's on Ebay and the like. Just beware when you are buying a second hand machine that the scum of the world are not taking advantage of you. There are MANY Minelab detectors that are counterfeit, I would imagine you can find these on Gumtree or Ebay but just beware and make sure that you buy legitimate machines. Also Minelab dealers sell second hand detectors so you could contact them - in fact, it is good to deal with the Minelab dealers because you know exactly what you are getting and if something goes wrong you can get it fixed. We always deal with our Minelab Authorised dealer when buying a metal detector unless I am 110% certain we know the person we are dealing with and the machine is genuine - and ALWAYS with a new machine. But it is an opportunity to get a machine at a fair price so check with you dealers and negotiate a deal for a second hand or old stock 5000. It may be an opportunity to get a machine for a dealer at a nice price, Time will tell! Love Minelab, Hate Minelab? It doesn't matter - help others by including your unbiased views of the new Minelab 5000 here. Many people are wondering whether to invest BIG dollars in the machine, help them out! Your Minelab 5000 metal detector review will appear on a Web page exactly the way you enter it here. You can wrap a word in square brackets to make it appear bold. For example [my story] would show as my story on the Web page containing your story. TIP: Since most people scan Web pages, include your important thoughts in your first paragraph.